MASSIVE $56K PRICE REDUCTIONThere is not a sweeter 25' Bertram on the market today. The "Ava Theresa" is one of the original Moppies, built in 1962. Even 57 years later she still holds her lines. The Raymond Hunt Deep-Vee entry allows for a great ride-soft and dry. This vessel has been cared for by the current owner, and it shows! With numerous upgrades through the years, she has been brought up to the highest standard-"mechanically" and "cosmetically". This Classic NEEDS to be seen, to be appreciated.Custom Aluminium Dual Axle Trailer Included! United Yacht Sales New Jersey would love to guide you through a personal showing of this 25' Bertram Moppie Diesel 1962. 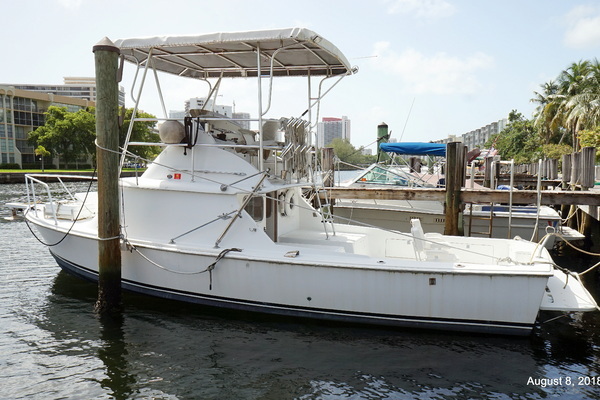 This yacht for sale is located in Jupiter, Florida and priced at $79,000. For a showing please contact us by filling out the form on this page and we will get back to you shortly! The "Ava Theresa" has a large deck/cockpit area. A custom built engine cover that lifts up on hinges, to service both Volvos. There are port and starboard fold down storage compartments.A Small Marlin chair sits in the middle of the deck. There are 2 bench seats to accommodate Captain and passengers. Helm Controls are at arms reach and plenty of unobstructed viewing thru the 4 glasspaneledwindows.HiGloss Teak trim surrounds the helm area. Awlgrip whitepaint shows in nearperfect condition as does the Blue Hull Awlcraft paintwork. Below deck is a V-Berth that can sleep2persons. There is a Teak and Holly floor. 12 volt Breaker Panel,TVand Stereo are also fitted.